This Edition contains further information about the staff and school as well as previously unpublished photographs. ​He was an Alsatian called Rex, who lived among the snows of the mountains of Lebanon and Syria. When the author first met him, in November 1941, Rex belonged to a Bishop of the Maronite Church. Rex disliked strangers, but James Riddell proved an exception. The dog became his devoted companion at the newly-formed ski instruction school which the author was appointed to command. ​Rex was a great favourite with the troops who came to the school from all regiments and nations – Australians, New Zealanders, Greeks, Gurkhas, and British. This is Rex’s story and theirs. 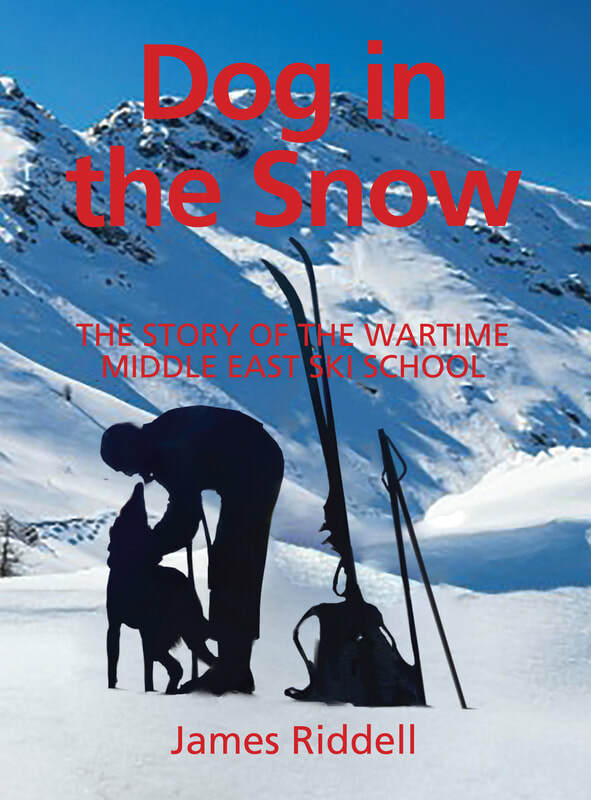 Dog in the Snow is an informative book about an almost unknown war-time activity, written with great charm and humour. All who love animals, and particularly those who can understand the fascination of skiing, will delight in the book. Lieutenant Colonel (Rtd) Pugsley is a military historian with a background of service as an Infantry officer in the New Zealand Army. A former senior lecturer in War Studies at the Royal Military Academy Sandhurst. He has authored and edited some 20 books and in 2015 was appointed an Officer of the New Zealand Order of Merit in recognition of his work as a military historian. This is a Second World War story about a man and a dog: Rex is a large Alsatian who roams free in the mountains of Lebanon and who adopts a British soldier sent there to set up a ski school. It is new and revised edition of a book first published in 1957 by James Riddell, a leading figure in establishing the sport of skiing in Britain in the 1930s. Riddell represented Britain in the first ever international Downhill races in 1929 at Zakopane in Poland and also in the 1936 Olympics at Garmisch. Skiing, along with photography and writing, was his life until his early seventies after which he turned to painting the mountains he ‘loved and knew so well’. His skills as a raconteur and writer are evident in this little gem of a book. In 1941 the vagaries of war saw Riddell appointed Political Officer in the rank of Captain in the city of Homs in Western Syria. A chance conversation at dinner at an Australian Field Hospital saw him seconded to the Australian Imperial Forces in the rank of Major as Chief Instructor to 1 Australian Corps Ski School. Siting the school led to his first meeting with Rex (the name given to him by Riddell). In a sense Rex adopted Riddell and the school instructors and students whom he supervised with a canine discipline. Both were together for the life of the school to Riddell’s great delight. It puts him back on skis for the next three years. The Australians returned to the Pacific to meet the Japanese threat, but the Ski School continued, becoming in 1942 the IX Army Ski School, the Middle East Ski School in 1942-1943, and with its expansion to cover all aspects of mountain warfare, including both ski and rock climbing, it became the Mountaineer Wing in 1943 up to its closure in 1944. As a New Zealand military historian who has written on the New Zealand Division in the Second World War I have often puzzled over photos showing New Zealanders on skis in Syria. Dog in the Snow answers this question as it will for anyone with similar photos who wants an explanation of why their father or grandfather, who was serving in the Middle East, appears to have been at one time or another a soldier on skis? Riddell confesses to not being able to record all of the names of the many people who assisted in the running the school. This new edition was prompted by the descendants of former staff members who linked with each other through the power of the internet and while not changing Riddell’s text have included photos of the school and its instructors, Rex prominent among them, as well as adding a chapter on the Rock Climbing Section and lists of known school staff. The photos are each worth a thousand words, as are the carefully chosen brief staff biographies, who, like Riddell himself, were each pioneers of the sport of skiing. Riddell’s second wife, Alison, has written the foreword which is as perceptive and engaging as the book itself. Beautifully produced and illustrated, Dog in the Snow fills a small but important gap in understanding the wartime lives of thousands of British, Commonwealth and Allied servicemen. It is a labour of love and a fitting tribute to those who spent part of their war on skis.